The Portugal national rugby union team is the rugby union side representing Portugal at international level. They are rated as a performance team in the new IRB four-band classification system, the second highest. Portugal had their first match in 1935 and now compete in the European Nations Cup and occasionally in the IRB Nations Cup. The team as well as all rugby union in Portugal is administered by the Federação Portuguesa de Rugby. Portugal qualified for their first Rugby World Cup in 2007 where they were grouped in Pool C along with New Zealand, Italy, Romania and Scotland. They are nicknamed Os Lobos, Portuguese for "The Wolves". Portugal have experienced unprecedented success in recent years. They have qualified to the World Cup held in France and although they lost all their matches they managed to score one try in all their games and led the score against Romania until the late minutes. Portugal were the surprise winners of the 2003–04 European Nations Cup and have continued to record impressive results, though they could only finish third in the following event. The IRB Sevens World Series circuit has allowed the Portuguese players to demonstrate their competence to the wider rugby world and consequently improve their game. In 2006–07 Portugal competed at every IRB sevens event for the first time. Portugal played their first ever rugby international in April 1935 against Spain. Portugal lost the game by a single point, 6–5. They played Spain again the following year with Spain winning 16–9. Portugal had more regular competition from the mid-1960s, and won their first game in 1966, defeating Spain 9 to 3. Portugal played Italy for the first time in 1967, losing 6–3. They also had their first match against Romania soon after and lost by 40 points. They defeated Belgium in 1968, and also played Morocco for the first time. The first game of the 1970s turned out to be a draw against the Netherlands. Portugal managed to draw with Italy (nil all) in 1972 and following that, defeated them 9–6 in 1973. After a number of mixed results throughout the early 1970s, Portugal won five matches in a row from 1979 through to 1981. They played Morocco, who won the encounter. After a 1983 draw against Spain, Portugal managed a seven-game winning streak from 1984 to 1985, including wins over Belgium, Denmark, Morocco, Czechoslovakia, Poland and Zimbabwe. The first Rugby World Cup was held in 1987, though it was by invitation, thus there was no qualifying tournament. From 1989 to 1990, the 1991 World Cup qualifiers were held for the European nations. Portugal started in Round 2b in October 1989. They defeated Czechoslovakia 15 to 13 in Ricant to advance to Round 2c. However here they were defeated by the Netherlands 32 to 3 and eliminated from qualifying. Portugal again participated in the 1995 World Cup qualifying competition for European teams, starting in Round 1. They were pooled in the West Group, and defeated Belgium and Switzerland, but lost to Spain, advancing into Round 2. Here Wales defeated them, and they lost to Spain. Portugal began play in Pool 3 of Round B in the European qualifying competition for the 1999 Rugby World Cup. Portugal won all their group matches except for the one against Spain, but still finished second in the group, which took them into Pool 3 of Round C. All games were held in Edinburgh, Scotland. Portugal lost 85–11 to Scotland, and 21–17 to Spain. Both nations went through to the World Cup and Portugal went into repechage. Here Portugal lost a home and away series to Uruguay. In 2002 Portugal began playing for a place in the 2003 Rugby World Cup in Pool A of Round 3 of the European qualifying tournament. They were grouped with Spain and Poland. Each nation only won one game, though on for and against Portugal finished second to Spain. Portugal were knocked out of competition. In 2003–04 Portugal won the European Nations Cup, losing only one match to win their first championship. In 2004 Professor Tomaz Morais, coach of the Portuguese national team at both sevens and fifteen aside, was nominated for the IRB's coach of the year award. This was a remarkable achievement for a coach from a third tier rugby nation. Morais has been credited with much of Portugal's progress in recent years. 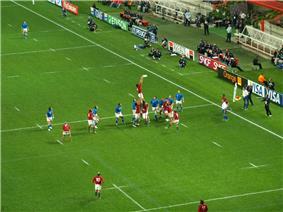 In 2006 it was announced that Portugal would receive a grant from the IRB to help develop their rugby to Tier 2 standard. Few details have been released thus far regarding how the money will be spent but it is hoped it will ensure that Portuguese rugby will be able to move onto the next level. In 2006 the inaugural IRB Nations Cup was hosted in Lisbon. The tournament featured Portugal, Russia, Argentina A and Italy A. It is anticipated that this will become an annual event and another medium through which the Portuguese team can develop their skills. Portugal began their qualification campaign for the Czech Republic, and went onto defeated Russia as well, but then lost to Romania. Portugal then drew with Russia 19-all, and then lost to Georgia. After a loss to Romania and a win against the Czech Republic, Portugal finished third overall in the standings, and qualified for Round 5. Round 5 was played in October 2006 as a three match series between Italy, Russia and Portugal. Both Portugal and Russia lost heavily in their matches against Italy, who easily qualified for the finals. Second place came down to the final match of the round in Lisbon. Portugal won the match 26 to 23 to make it to Round 6. Round 6 was a home and away series against the Round 5 Pool B winners, Georgia. Portugal lost the first match, but drew 11-all in the second meeting. Georgia went through to the finals, and Portugal entered the repechage round where they defeated Morocco 26–20 on aggregate. The team then faced Uruguay for the last position in the finals. The first leg of the two-match Repechage series was played in Lisbon. Portugal won 12 points to 5, taking a seven-point lead into the final game in Montevideo. Portugal lost 18 points to 12, however, on aggregate, they won by just a single point, 24 to 23, sending them to their first ever World Cup. They went to Pool C, alongside favourites the All Blacks, Italy, Romania and Scotland. Having qualified for their first World Cup, several players were subsequently arrested in the ensuing celebrations as a result of an altercation with local police. No charges were laid and the players involved were allowed to leave Uruguay. In the 2007 Rugby world cup, Portugal were anticipated to be crushed by their fellow nations, particularly in their match with New Zealand. Nevertheless, Portugal played competitively, highlights include preventing Italy getting a bonus point as compared to losing by 83–0 before the tournament, scoring a try against the All Blacks and coming within a try of beating Romania before losing 14–10. They also managed to score in all the four games, unlike Scotland and Romania. Portugal team were celebrated for their commitment and passion, and for being the only amateur team to make it to the World Cup. After the World Cup, Portugal faced some problems, including the end of the international career or of the career of several key players, like Joaquim Ferreira, Paulo_Murinello and Rui Cordeiro, and achieved only one win over Czech Republic in the final round of the European Nations Cup tournament, finishing in 5th place, their worst result since 2002. On 1 November 2008 they lost at home against Canada 21–13, in a recent friendly game. Tomás Morais to face the upcoming edition of the Six Nations B, that also qualifies for the 2011 Rugby World Cup finals, had New Zealander Murray Henderson assigned as assistant coach. Tomaz Morais was replaced by New Zealand coach Errol Brain, in October 2010, with a three years contract. He had mixed results, starting with strong performances but ended up with disappointing games. He was replaced by Frederico Sousa in October 2013. Vasco Uva is the most capped player for Portugal (100) and also has the record for most matches in the starting XV (93). The highest scorer for Portugal is Gonçalo Malheiro, with 279 points. Malheiro is also the player with the most drop goals (12). Pedro Leal holds the record for most conversions (42) and penalty goals (50). António Aguilar with 24 tries is the player with the most tries scored. Duarte Pinto has the record for most matches as a substitute, with 23 substitutions. Bernardo Duarte holds the record for most matches as a substitute, without ever playing in the starting XV (13). Last updated: Kenya vs Portugal, 30 May 2015. Statistics include officially capped matches only. Last updated: Russia vs Portugal, 21 March 2015. Statistics include officially capped matches only. ^ Only includes test matches in which the Portuguese Rugby Federation awarded caps to the players involved, according to their official website. ^ a b "Most matches". Scrum.com. Retrieved 2014-06-09. ^ a b "Most points". Scrum.com. Retrieved 2010-10-04. ^ a b "Most tries". Scrum.com. Retrieved 2010-10-04. ^ "Most starting matches". Scrum.com. Retrieved 2014-06-09. ^ "Most drop goals". Scrum.com. Retrieved 2010-10-04. ^ "Most conversions". Scrum.com. Retrieved 2010-10-04. ^ "Most penalty goals". Scrum.com. Retrieved 2010-10-04. ^ a b "Most substitutions". Scrum.com. Retrieved 2010-09-26. ^ "Statsguru / Team analysis / Portugal / Test matches". Scrum.com. Retrieved 2012-01-26.